On my way to a rodent treatment in Bristol, I noticed this site on a wall to an adjoining property. There was a lot of flies swarming around the carcass of a dead bird. 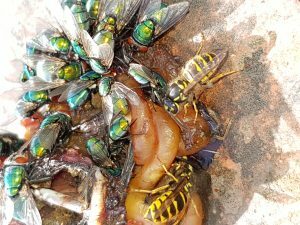 On closer inspection, I noticed that in amongst a large number of Greenbottle flies, were two wasps feeding on the carcass; this was the first time I had ever seen flies and wasps feasting on the same foodstuff. At the beginning of the season, wasps will feed on protein rich foods to enable them to carry out their duties for the advancement of the nest and colony. Collecting nesting materials, food for the grubs and tending the queen. As the season progresses, the wasps will begin to prefer sweeter foods, and that is when they become a nuisance at picnic sites and family barbeques.